In my continuing search for programming languages that do not give anti-virus applications periodic fits, I ran across LiveCode which began 17 years ago under different names. The Community version is Open Source and free to use. Yippie! It’s lineage goes all the way back to 1987 with an Apple product called HyperCard. Those of us who are old enough in IT or in Education will remember HyperCard as it was very popular for over 10 years. And Apple gave it away for free with the purchase of Macintosh computers. I happened to have a copy of it long ago before the Internet existed. LOL. And a good bit of that knowledge came back to me. But, I still had to do a lot of reading about all the new capabilities. LiveCode incorporates everything that made HyperCard a unique application development environment. Each file or Stack can contain any number of Cards (i.e. think of Rolodex cards in a file). In its simplest uses, users can create simple databases, multimedia presentations and training programs. I decided to see how well it would work for Bible study and while I am still learning its strong and weak points, I am posting up what I call LiveBible. I’ve spent about 60 hours in the last two weeks (nights) getting to a usable Bible study program. 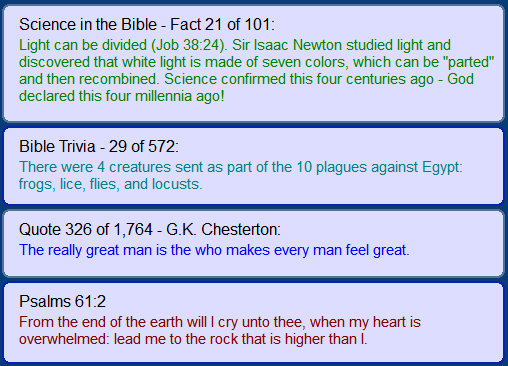 LiveBible uses a one card stack to display various Bible information. A secondary stack contains additional information and I hope to add a lot to it later on. The program can create executables for Windows, Macintosh and Linux operating systems. I’m only posting up a Windows version for now. To install the program simply download this file below then extract (copy) all of its contents to an existing or a new folder of your choice. 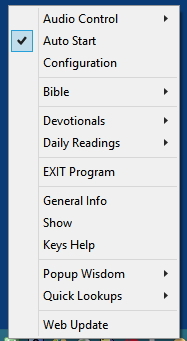 Double click on the LiveBible Startup icon to run the program. 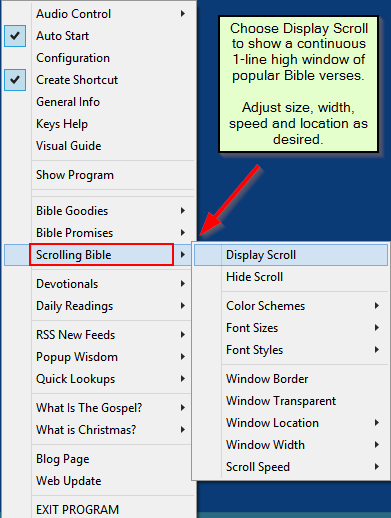 The main window displays one Bible chapter on the left side and either Search/Dictionary, Devotionals/Readings or Commentary on the right side. Users can press N for the next chapter, P for the previous chapter or use the small arrows at the bottom left. 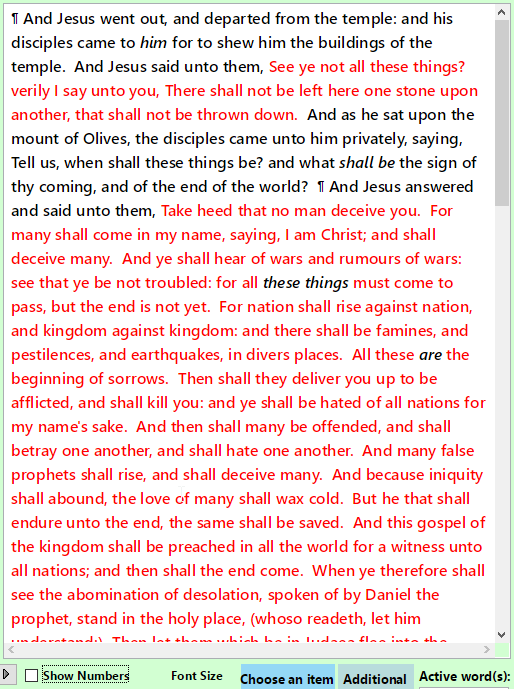 To go to a specific Book and Chapter, click on Load Chapter or press L.
Type the letter B or click on the green Switch at the bottom left to change from the original King James to a more modern version. The modern version also shows the words of God in red in the Old Testament. Clicking on the Show Numbers item will either show or hide the Verse numbers. 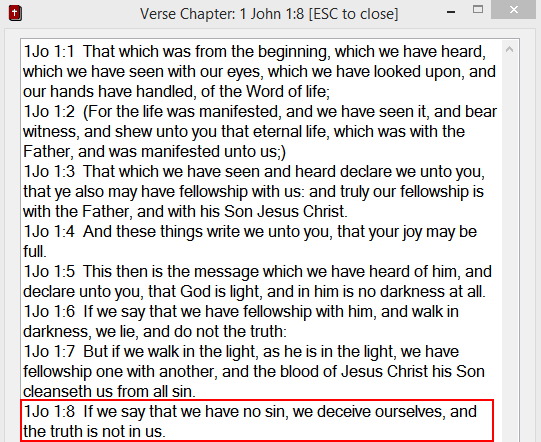 When the numbers are off, the verses are shown as one paragraph, as below. 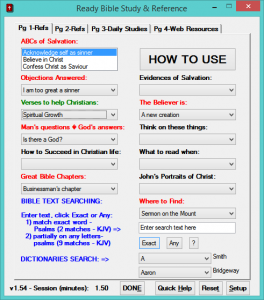 To search for Jesus, either right click the word, click Find Text or type F (find). The found verses are in the upper right corner of the main window. The number in parens is the total found verses. 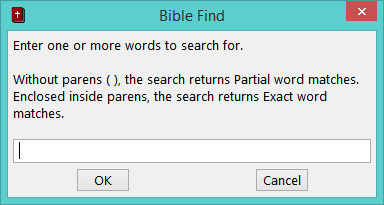 With Exact on, search will match upper/lower case. Click Exact to turn it on and off (or type X). 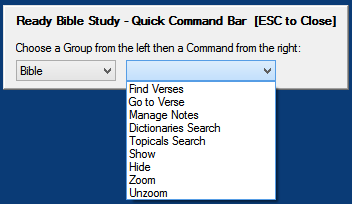 Right clicking on Find Text will prompt for an item to find in the Dictionary. 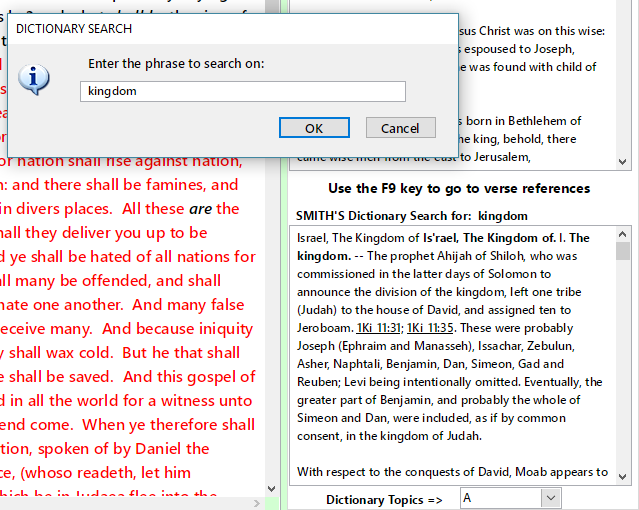 Right clicking on a word or phrase in the Bible text will also allow Dictionary searching. The current Commentary for the shown Chapter is displayed when you move through the chapters or when clicking on the Commentary tab. The two Commentaries are Matthew Henry’s Concise Commentary and the Jamieson, Fausset & Brown Commentary which is mostly verse by verse. Daily Devotionals and Bible Readings are found on the second tab. Use the arrows below to change them. There are three Devotionals and three Readings for each day. If you would rather listen to any of the items, you can click on Choose Items to Speak or click in any window then press F6 to add that item to the Audio Queue. You can press the F8 at any time to Stop Audio. If you want to display a larger window, press Z or F12 to Zoom and Un-Zoom. Lastly, in this release is the start of an additional resource stack which will be added to. Click on Additional Resources to display it. Press ESC key to close this extra window. Pressing N or P will show the Next / Previous card in this stack along with clicking the arrows at the bottom. Pressing the ? key or clicking on the ? button will display general help text as well. Recently, I found a browser called qutebrowser that uses keyboard commands extensively. I used it for a while before I discovered similar add-ons for Firefox and Chrome that are based on the VIM Linux editor. I was about to make a time commitment to learn VIM but then thought “why not write a program that truly uses one letter commands to navigate pages and tabs?” The resulting AutoHotkey program works with both Google Chrome and Firefox (and other browsers based on them). To install just place the contents of this Zip file 1KeyBrowsing into any location and run the 1KeyBrowsing.exe file. The two ico files are the program’s icons and the gif file is the quick help accessed by pressing the ? key when the Quick Keys are On or active. The program’s right click menu is quite short. There are two modes of use: Heavy Browsing or Heavy Typing. If you are editing/typing a lot during browsing then use Heavy Typing as it keeps the Quick Keys Off unless you turn them On. 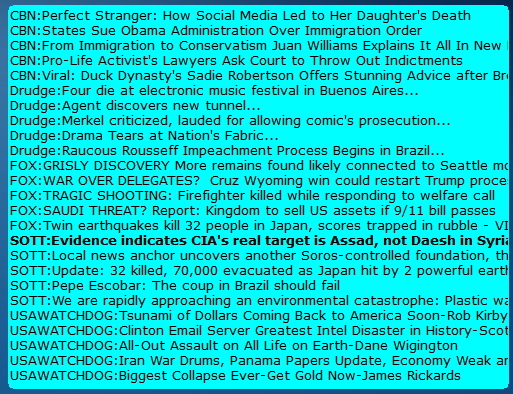 Or, if you are scanning news pages, doing a lot of reading and have a lot of tabs open then set it to Heavy Browsing which keeps Quick Key On. Choosing “1 Key Browsing Info” will display basic help. After this information is displayed, users are asked if they want to see the key commands list. This list is displayable any time by pressing the ? key when a browser is active and Quick Keys are On. After starting 1KeyBrowsing, whenever Firefox or Chrome are active, the program will display either “Quick Keys (OFF) or Quick Keys (ON)” in the browser’s title bar. Pressing the Insert key will turn Quick Keys on and off. With Quick Keys On, press t to open a new Tab then press the n and the p keys to move to the next and the previous Tabs. 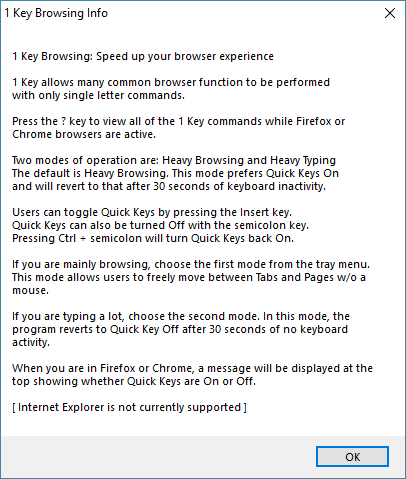 Refer to the Quick Keys Commands List and it won’t take long to learn a keyboard method to control your browser. Due to the fact that hackers use more and more ways to create malware, spyware, etc. it has become more difficult to write software that does not cause antivirus programs to sometimes display warning messages. For example, my computer at work decided to eat two of my home grown programs the other morning when I logged in. I have been using those same applications for months without incident. But, after an update of the antivirus software database, it decided they were dangerous and removed them. So I had to add those programs as exceptions to the antivirus and copy them back to my work computer. What a pain! After looking for several weeknights of time, I have determined that I can stick with AutoHotkey as my main script language if I do not compile my programs. Compiling is the process that takes the plain text language of any script or program and converts it into a standard executable Windows program. 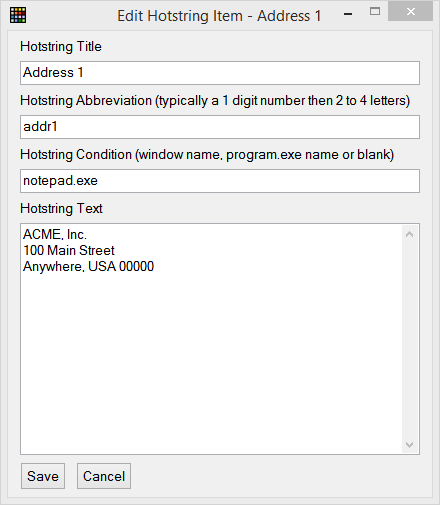 For AutoHotkey, the user written script is combined with the AutoHotkey interpreter and any other icons, included files, etc. into one file ending with .exe. Doing this makes it easy for other users to run any of my programs. But, starting last summer, more and more antivirus programs throw up warning about some of my applications. Here are other alternatives I’ve been looking into, most of which are over 20 years old. All of these programming languages are free to download and use. Very small and fast. Decent Graphical User Interface applications can be written quickly. Distribution contains the Rebol interpreter and user written script files. Language allows are very concise programs that can be much quicker to write. In addition to the Forum there are over 1,000 user written scripts on Rebol.org. The Rebol websites are also run by server side Rebol scripts. Takes a bit of getting used to as it is somewhat different from traditional languages. Many standard features of Windows applications take extra work to implement in Rebol. Documentation of a lot of features is incomplete. Very frustrating to figure out how to do things that are already part of most Windows programs. being able to compile script to exe files for different Operating Systems (Windows, Linux, Mac OS, Android). Source code protection via compiling. Same Cons as Rebol plus it add features and takes some away and has a ways to go before all the desired features are present. Several antivirus warnings on VirusTotal. This language has been around for quite a while and has a lot of tools and add-ons available. The Tk toolkit allows the creation of any sort of graphical interface. Last updated this year to v8.6.8. Somewhat difficult syntax with great expansion of functions over the years. A wide variety of add-ons take some time to sort through. Three steps are required to convert scripts to executable files. And the smallest executable files are around 5 MB. A somewhat more Basic like language which is easier to learn than Tcl. Scripts can be easily converted to executable files with Bind. Graphical User interfaces can be created with libraries for Windows 32, GTK (from Unix) and IUP. The last two libraries help create programs for Windows, Mac and Unix. Getting a proper development environment setup can take time. Euphoria relies on system variables to find its interpreter, includes and compiler. Several editors are available and choosing one takes time as well. The language relies on lots of included .e files for most of it standard functions. Has all the bells and whistles to create graphical Windows programs. Can run scripts via its interpreter or compiling. Updated a couple of times a year. Source code protection via compiling with compression. Causes Antivirus programs to display warnings when AutoHotkey applications contain other files or heavily use the keyboard. Not as modern as some script languages. Sister language to AutoIT which now uses a BASIC-like dialect. A few to many antivirus warnings depending on script complexity and embedded files. Has a huge following and ecosystem. Has a lot of different types of installations from first time users to professionals. Recognized as one of the top 5 programming languages to learn and make top dollar with. Largely used for scientific, numerical and charting intensive applications that dive into lots of data. Has a quite stringent language syntax. The sheer amount of options take time to grasp. Using the Anaconda environment takes up 6gb of disk space. Several antivirus warnings with a compiled exe file. As can been seen from this table, while there are several script languages that can be compiled for easy distribution to users, there are many difference between them. From as little as 332 kilobytes to as much as 5,709 kilobytes, all of the programs create the same output. I’ve always preferred small executable files for simple utilities and don’t really see myself using something like Python for anything but data manipulation, number crunching and fancy statistics and charts. While Tcl and Euphoria can do the types of programs I like to write, either one will take time to get a good handle on. I have written one application in Rebol that has shown me how little program code can accomplish quite a lot. But, the drawbacks are that it doesn’t have the same look and feel as most Windows programs, out of the box. I will probably spend more time with it. Eventually, Red will be more complete and I’ll check it out again. It’s creator plans for it to support PC and Mobile devices, which will be quite nice even if that is a year or two away. In the meantime, I will look into repackaging my AutoHotkey applications with new Installers and see if that avoids most of the Antivirus warnings that I and others have experienced. For close to two years, I have been using a standing computer desk while at work. After reading multiple articles on the dangers of too much sitting, I decided to give this a try. It has worked pretty well, but, I started noticing a couple of varicose veins in my right thigh several months ago. I’ve never had varicose veins before. Recently, they got worse, so I started Googling “standing and varicose veins.” Well, it didn’t take long to find out that too much standing is a common factor in getting varicose veins and can also cause other health issues. Stretch or move around for 2 minutes. Generally repeat this cycle during the day. Here is a link to the Cornell Study findings. 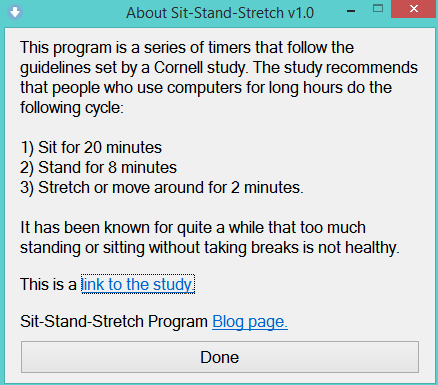 A new program has been created to remind users to go through this Sit, Stand, Stretch cycle. 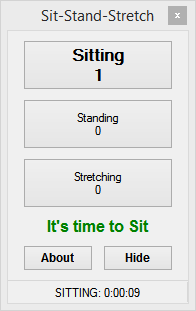 (Nov 4th, 2018) The setup for version 1.03 of the program is here Sit-Stand-Stretch-setup. Just open and run the included setup application. It will place the program into your Desktop folder. The shortcut appears as below. 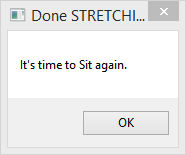 When the program is started, it begins a new Sit phase of 20 minutes. It will remain onscreen or users can click Hide. It will also show how many minute/seconds the current phase has been running and its button is in bold text. The counters underneath are just for general information. Users can restart any phase by clicking that button. 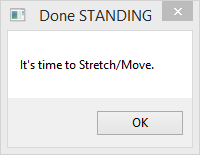 And after 8 minutes of Standing, a prompt will appear reminding users to Stretch and/or Move for a least 2 minutes. 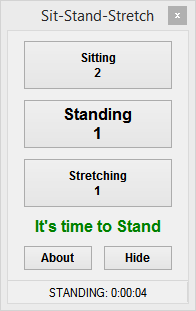 When the 2 minutes of Stretching is done, the next prompt is to start Sitting again for 20 minutes. 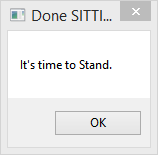 So, this cycling of Sit, Stand, Stretch continues until you exit the program. If the computer goes into Sleep or Hibernation, upon Waking, the program will start in Sitting phase again. The program window can be placed on top of other windows by right-clicking on part of it or by choose “Always On Top” from the taskbar menu. Using “Always On Top” removes the title bar of the Window, which is just a visual indication that it is turned on. Use the left or right mouse buttons to activate the system tray menu. Click “link to the study” to see the original study from which I got the information to create this program. 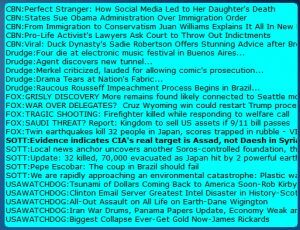 Or click “Blog page” to browse to the program’s home page. The “Show Window” menu option will always display the program window in its last position. If the window has gone off-screen then choose “Restart Program” to center it. That’s about it, feel free to leave comments and/or suggestions. Synopsis: This program’s first use allows users to collect their most used programs, web links, documents and folders into a small grid so they can be quickly launched or switched to if they are already running. It’s second use is to let users add textual items which are displayed when the mouse passes over them. The third use of the program is the creation of Hotstring items. The fourth use is to add popup Reminders to any Text items. A Hotstring is a short sequence of characters that expands to a phrase or even several paragraphs after being typed. Manage and Launch all the types of Windows shortcuts: Files, Folders, URLs, Programs. Launch any item via mouse, keyboard or a Hotstring. Create Hotstrings to enter standard texts with a few letters. Add Reminders to any Text items. Display and open Recent Files/Folders. 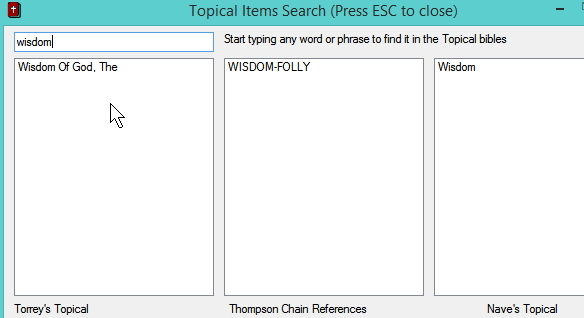 Store and quickly display or search on Textual items. Display a Rich Text editor for quick notes via the F9 key. Set items on any Tab to have characteristics of typical ToDos or a Kanban board. Updated to v1.45 on 10/14/18: Fixed: some minor issues and brought back the use of Icons in the program’s menus because I like them. If an older computer doesn’t have some of the icons, no errors will be displayed. Fixed: The status bar now displays Double-Click here to enter Edit Mode whenever the mouse is not over a button. Added: some more help text in Features and an option to go to the Blog Page from the Tray menu. A few screen shots in this page have also been updated. While looking through some free software sites, I came across an older program called Pigeonhole Organizer. It allows users to store a lot of text through small labeled buttons. 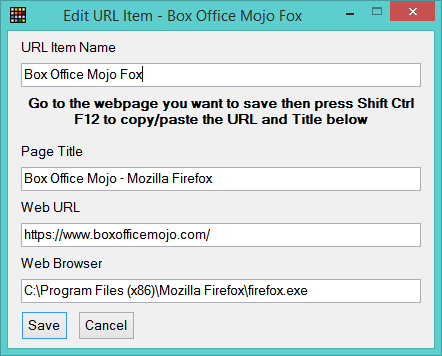 As the mouse is moved over buttons the underlying text is automatically displayed in a pop up window. Users can drag items around, color them and search them. A link is here pigeonhole. In my opinion, this is a pretty neat idea, but way too many buttons on one page. Since that program hasn’t been updated in 11 years, I decided to write something similar in AutoHotkey. In this version you start with 30 items in three columns of 10. The font style and size are adjustable. Users can select from 1 to 6 columns. Also, to make it more versatile, additional Tabs can be used to help organize items. The screen shot below has several Tabs organized by the type of items. Clicking on the + tab will prompt to add another tab. Text item – users type or copy/paste into a small text box. This box will automatically display as the mouse moves over Text items. 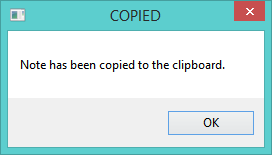 You can also turn on a capability to Monitor Clipboard Copies which enables you to select then copy text (Ctrl C), the program will see the new text on the clipboard and prompt you to create a new Text item. If you click Yes then that text will become the new item. This feature is not intended to remain on always, but, just when you are trying to quickly build up Text items. Program item – enter the program name and click the … button to select the desire program OR just drag and drop the program icon over the InfoGrid. Document item – same as number 2, drag and drop is easiest. 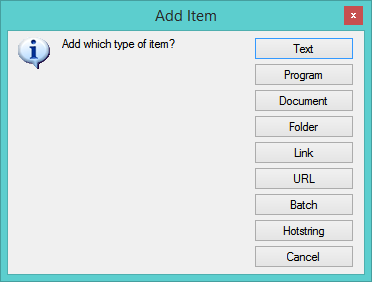 Folder item – enter manually or drag and drop. Link item – shortcut files (ending with .lnk) can link to any of the above items and are converted to one of them. URL item – these files are created by dragging from the address bar in a browser into a folder. Batch item – if you want to launch many of your items with one click, just create a batch item and it will let you check mark any set of items to launch. It’s a great time saver and won’t relaunch items that are already open. Hotstring item – hotstrings are short sequence of characters that are replaced by much longer text. For example, typing addr1 can enter the address below. Hotstrings can also be used to launch any item. Users can edit, delete, cut and paste items. Since the program allows for additional Tabs (page of items), items can be Cut the moved from one page to another. After clicking Cut click the empty location where you want to move that item to and you will see an additional Paste option. 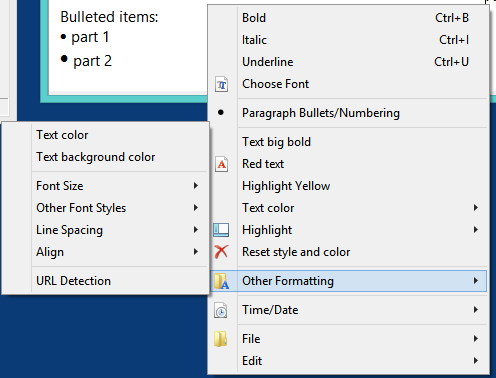 Adding a Text item – click an empty item then choose Text. This window will be displayed. At your text item name and contents then Save it. When you mouse over any Text item, it’s contents are displayed. If you need to resize the window or grab any text from it then press a Shift key or double-click the status bar to enter Edit mode. You can do anything with the window until pressing Shift again to leave Edit mode. The status bar and window title will change to let you know when you are in Edit mode. The program’s menu options are easily understood. Users can backup and restore their items file to/from any folder. All data is stored in InfoWarp.ini which is in the same folder as the InfoWarp program. An Auto Backup is also done every minute to your Temp folder in case you delete items you didn’t mean to. 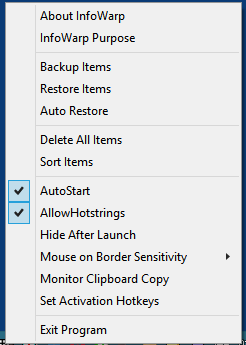 To do an Auto Restore, just right-click on the Tray icon and choose that option. You can Delete ALL will start with an empty grid, if desired. Sort ALL will sort each Tab (page) individually by the items names. Choosing Find Text Only will ask for the search text and highlight items that match. When the mouse moves over items containing matching text, the program will select the first match. Below the word Hotstring was searched on. Find Any search item names, folder names, text, etc. on the current Tab and highlights them. 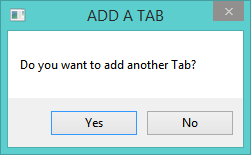 Users can Add, Delete and Rename Tabs from the menu or by double-clicking an existing Tab or using the menu. 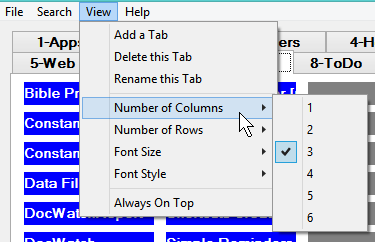 The font size and the number of columns are also changeable. When going to a lesser number of columns the program will prompt to Sort items and it will let you know if not all items will be displayed. Items will not be lost by Sorting or reducing columns. 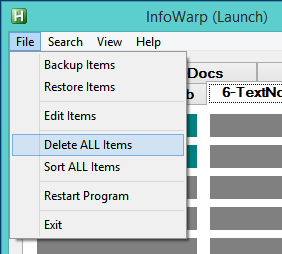 Dragging a program shortcut onto InfoWarp displays a prompt for the name you want to call it. Then it is added to the grid where you dropped it or in the first available empty spot. You can select a lot of shortcuts at one time and drag them over the grid. You will be prompted for a name for each item, the default will be a short name based on the item’s filename. Once a grid is full, you will be prompted to add another column. The program can maintain up to 6 columns. Or, you can add additional Tabs or pages which can keep the number of columns small. Users can press Win-Alt-I to show the program, then press the number of the Tab they want to display and then press the Space bar to show letters by each item. At this point, pressing a letter will launch the desired item. [If you get here by mistake then press the ESC key to remove the letters.] Clicking on other Tabs or pressing numbers is disabled until you type in the letter of the item you want or press ESCape. This behavior is normal. The picture below (camera shot) shows the quick access letters. My apologizes for the quality. While InfoWarp is waiting for a quick letter to be pressed, I was unable to take a normal screen shot. For non Text items, their path is displayed in the status bar while the mouse is moved around. This is helpful if the item name isn’t self-explanatory. Users can drag any type of shortcut, program or folder over the main window and it will create corresponding items. Typing addr1 will send the address text to whatever program that is active. So, typing Addr1, addr1, ADDR1 will all cause the Hotstring to fire. If you want a Hotstring to only be active in a particular program then enter its name under Hotstring Condition (i.e. 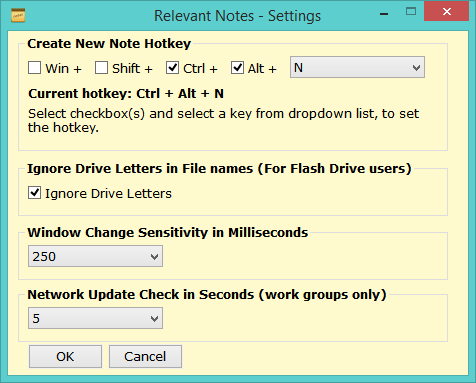 notepad.exe would only make a Hotstring active in Windows Notepad, as above). To create a Hotstring for a program, folder or document, simply place the Hotstring inside brackets as shown here. Typing ntpd will run Notepad, typing prt will display the Printers Control Panel. *IMPORTANT* If you create a Hotstring and it doesn’t immediately activate you can go to File, Restart or Search, Display Hotstrings and click on Restart to reactivate all Hotstrings. 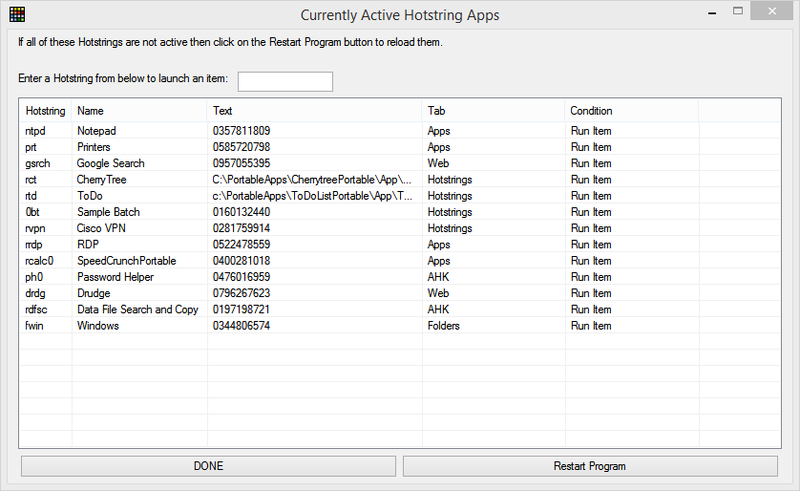 You can also create use a Hotstring to launch a program as shown below. Normally, it’s better to drag and drop programs to create their items. But, for some portable applications, the program used to launch them is not the same name as the program themselves. 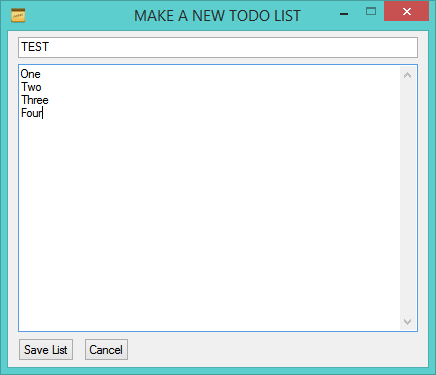 In the example below, the program is started with PortableToDoList.exe which runs ToDoList.exe. This causes switching to ToDoList to not work properly. 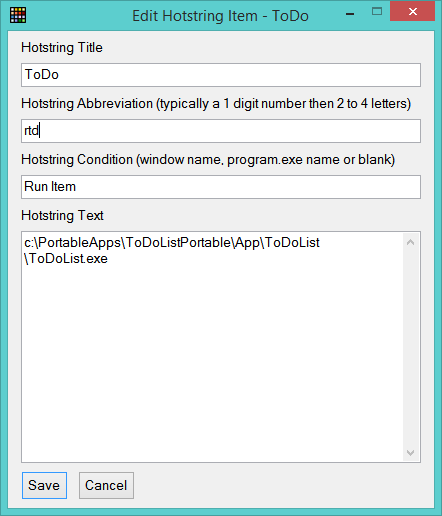 But, one can add a Run ToDo (rtd) Hotstring like this and it will activate any running copy of ToDoList. 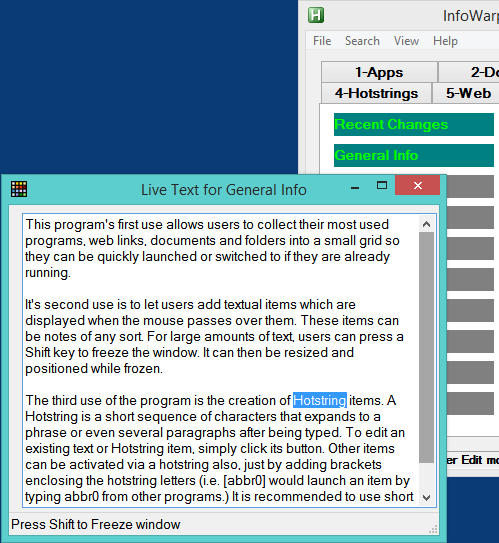 In this version Hotstrings may contain commands that move the cursor around, click the mouse and activate other keys like Ctrl, Alt, Win and Shift. This is a test letter for anyone. The underlying AutoHotkey scripting language has a Hotstring section with lots of help info online. 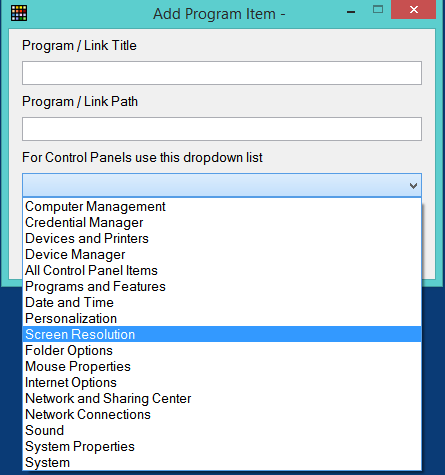 When adding a Program item, you can select from a bunch of Windows Control Panels or click the … button to navigate to a program to add. 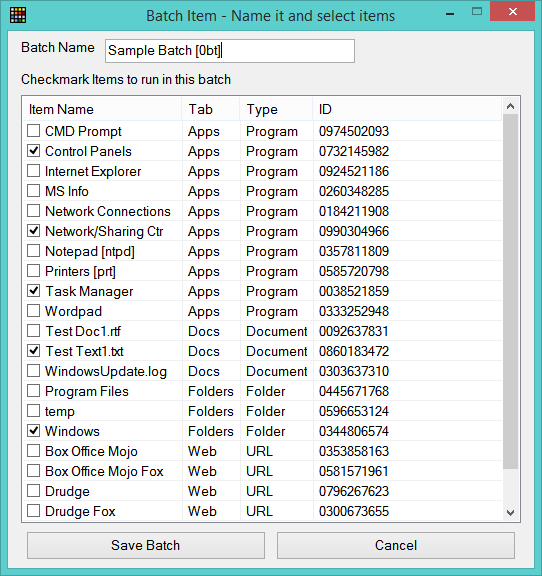 Creating a Batch item will display all items for you to check mark the ones that are part of the batch. In this instance, Sample Batch is the name and it will run the checked items with a click or by typing 0bt which is its Hotstring. Every item has an ID assigned to it, so if you move items to different Tabs, batch items will still work properly. New Hotstrings do not always activate but you can Restart the program to take care of that. Using the Search, Display Current Hotstrings will so the ones you have created. 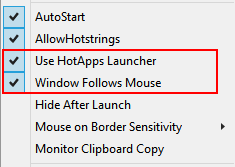 Since the typing of Hotstrings can interfere with some applications or overwrite say a cell in Excel, users can press both Shift keys to display the Hot Apps launcher window. From here, just start typing a Hotstring. When a complete Hotstring is entered this window will close and the application will be launched. If you start typing a Hotstring, the list will narrow down. Once you have entered a complete Hotstring that item will launch. For web pages, most users will just save bookmarks and/or several start pages and be just fine with that. But, for the sake of completion, I added the launching of Web pages via their URLs as well. URL items only need a name and a URL to launch a web page. If the web page title and browser are saved the program can crawl through all open web pages looking for the one you want before opening a new browser tab. To store the extra info, just press Shift Ctrl F12 when the web page is active. Some web pages don’t work in every browser so this lets users specify the browser to use to fix that issue. Certain settings can be changed or turned on and off if you wish by right-clicking the Tray icon and by using the program’s Menu bar. 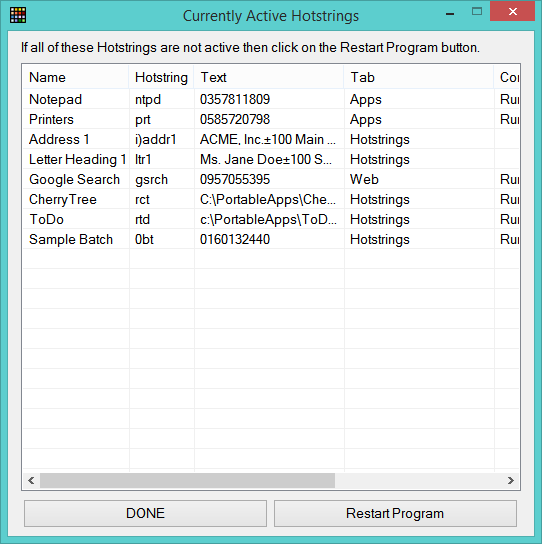 Items starting with AutoStart are either checked or unchecked and are remembered when restarting the program. New v1.23 menu items are in Red. There is more information in the program menus and also a Tutorial section. 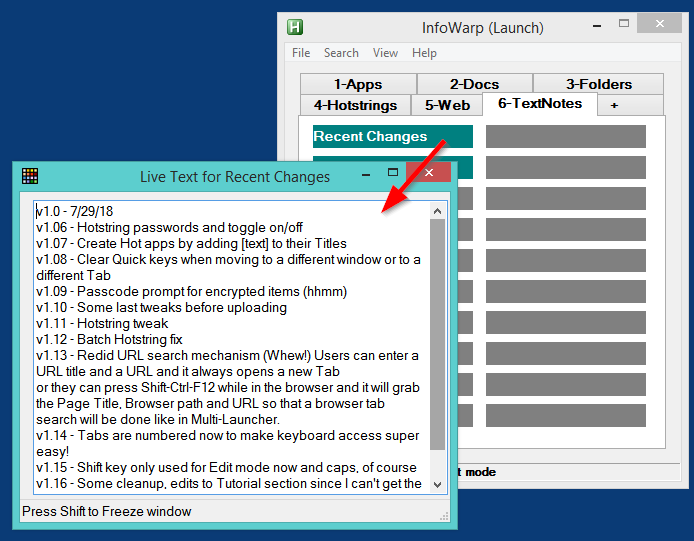 Since InfoWarp is primarily a launcher, it can be set to hide when items are clicked or by clicking on its Tray icon. 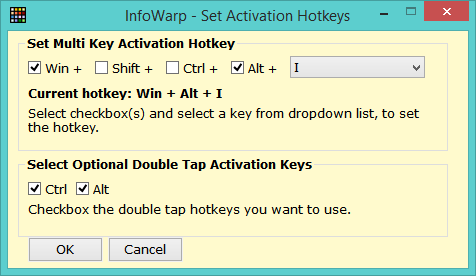 The default Hotkey to show/hide the program is to press the Windows, Alt and I keys together. You can also turn on double tapping the Ctrl and the Alt keys to show the program. Several settings will restart the program (deleting Tabs, sorting, turning Hotstrings on and off, etc.) which is normal. 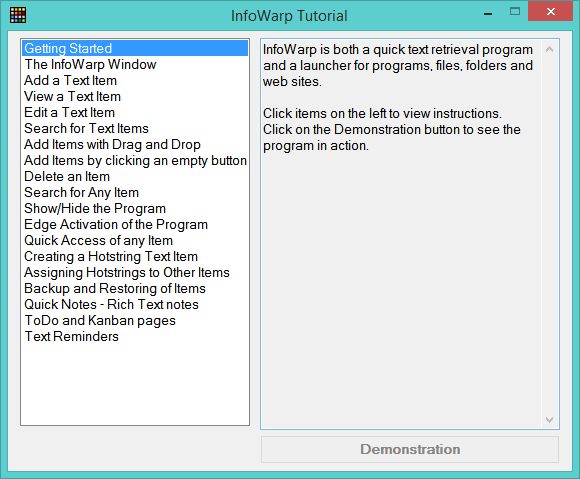 To summarize, the two main uses of InfoWarp are to launch programs, documents and folders AND to store lots of frequently referenced text for rapid display. Please read through the purpose, features and the Tutorials for more information. 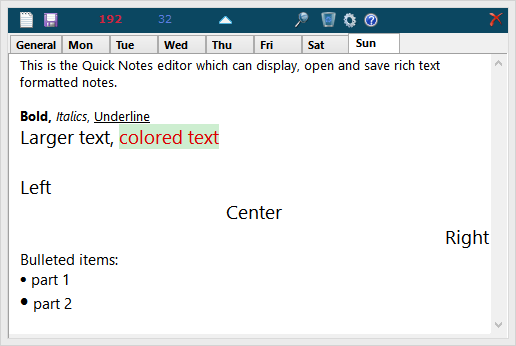 The new Quick Notes editor in v1.33 is accessed from the menu bar or the tray menu or by pressing F9. All of the most typical word processing formatting is available in this window. You may use up to 16 tabs (notes) and click on the Gear to set names for them. If you use week days for names then pressing F8 will take you to today’s note. Pressing ESCape or clicking on the X will save changes and hide the window. Right-click in the window for the formatting menu. Click on the (?) in order to see quick help. Clicking on the magnifying glass will display the Find Toolbar so you can search for text. Adding a time or an interval to a Text item will cause a popup to be displayed. This will display popups at the bottom of monitor 1 as below. Click on reminders to close them. 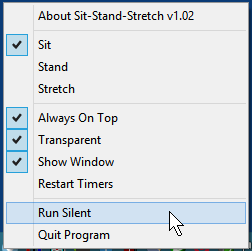 You may silence Reminder popups by choosing Silence Reminders from the right-click tray menu. By naming Tabs specifically, tracking of simple ToDos or Kanban flow can be done. 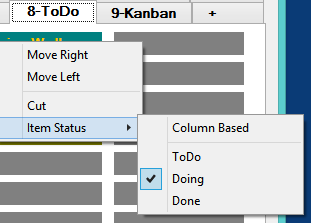 In a two column setup, ToDos will start in status TODO then change to DONE when they are moved to the right. In a three column setup, Kanban items will start in TODO status and go to DOING then to DONE by moving them to the right two times. Right click items to move them Left or Right to the topmost empty cell. The default Tab names for this feature are ToDo and Kanban. 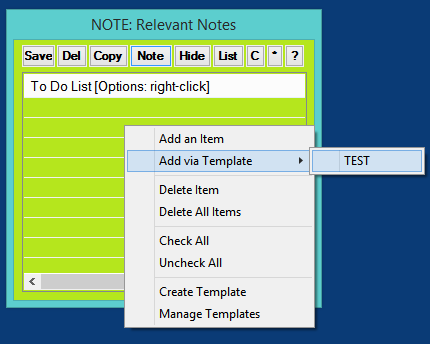 Other names can be entered with Set ToDo/Kanban labels on the Right-click Tray menu. This is shown below. 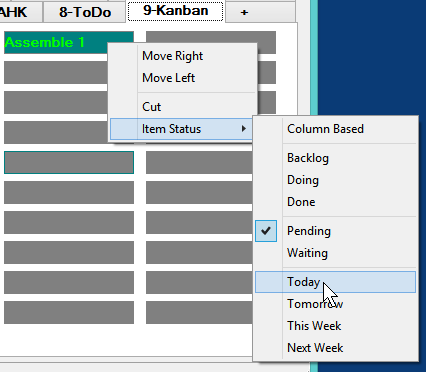 Kanban items work the same way, but, require three columns for TODO, DOING and DONE. This labeling merely helps users to remember the status of each item and is not part of the Item’s name. *New* Additional Kanban status codes are available. Right-clicking on a Kanban item will display other codes you can use to track progress on it. If you use any of these status codes, the item’s text color will change. You can switch back to the simpler Column based status as long as you have at least three columns for Kanban items (Backlog, Doing, Done). Using these status codes allows you to have fewer columns and still track the items. ToDo items have less additional codes. 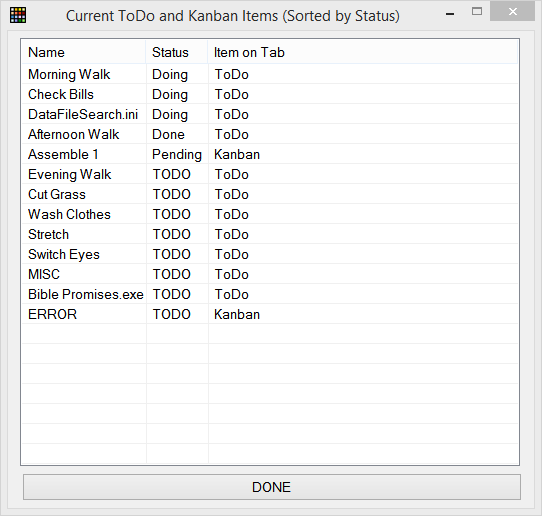 *New* ToDo/Kanban reports from the Tools, Display Current ToDos/Kanbans option. *New* Statistics The program can now display a summary by item type by choosing Display Basic Statistics from the Tools menu. It was easy enough to do a quick script to display the nearest airport weather so I started fleshing it out into a regular application. I added some motivational quotes (every 20 minutes) also. And, if your computer is very busy or running low on RAM memory, the program will display alerts for those as well. 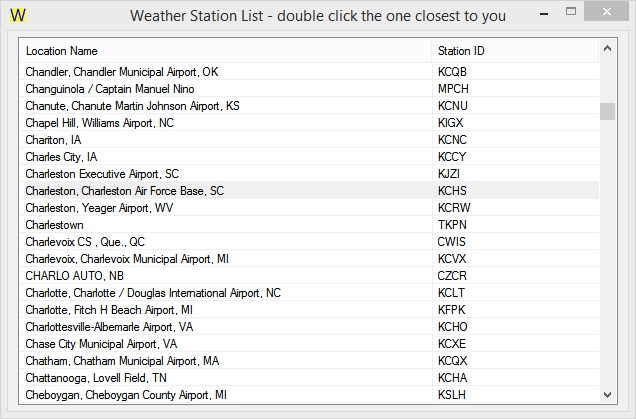 When you run the program, you will need to set a weather station location that is closest to you. After that, you will see updates every 15 minutes and random quotes every 20 minutes. You can turn the quotes and PC stats on or off. 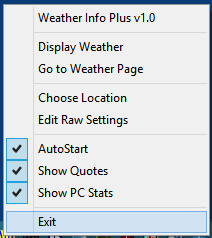 If you miss a weather popup you can always place your mouse over the program’s icon in the taskbar. It will display the last weather update from there. The Tray icon’s colors will correspond to those above. Quotes are displayed every 20 minutes if active. 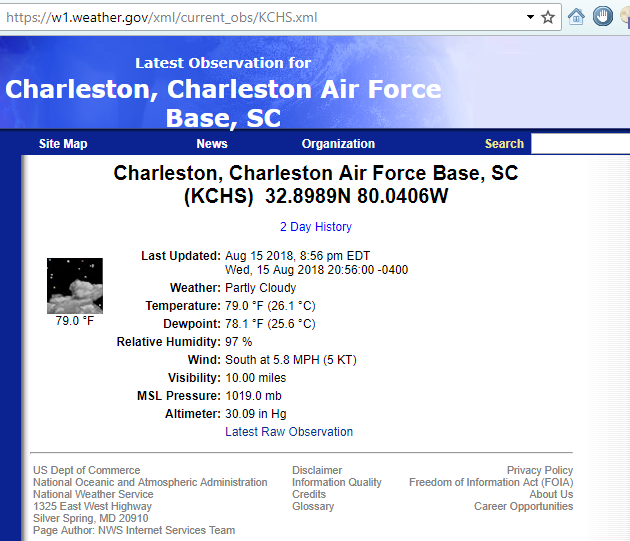 Mouse over the tray icon to see the last weather stats. Clicking the tray icon will turn off all popup items. For those who like it and want to tweak it more, they can set over values as shown below. For those curious as to just how much time they spend in different applications, feel free to download TimeLogger. It is a very simple program that just keeps totals for each application you work with. Clicking it’s icon will show or hide the TimeLogger window. You may Pause it for program you don’t wish to time. When you exit the program, it creates a comma-delimited file that you can import into Excel, or you can just do Paste (Ctrl-V) into any application right after you quit TimeLogger. Click the icon in the Taskbar after running the program displays it’s window. Right-clicking the tray icon shows this menu. You can Pause the program from here. When you exit the program, you will see a summary window. 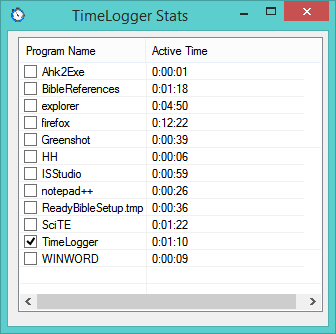 I am working on Windows Logger which will allow times to be accumulated by Window Titles and/or program names. You will also be able to categorize timed windows for project work. Important note – there are a few antivirus programs that report Ready Bible Study to contain Trojans or Malware. This is not true. The reason is that other people have written malware using AutoHotkey, the script language I also use. This causes almost all of my applications to give false positives by antivirus programs. I am working on ways to lessen these alerts and possibly rewriting some applications in another programming language (See QuickBIBLE). My apologies for any confusion this may cause. *NEW 12/15/18 * Use Installer #2 to avoid antivirus messages. 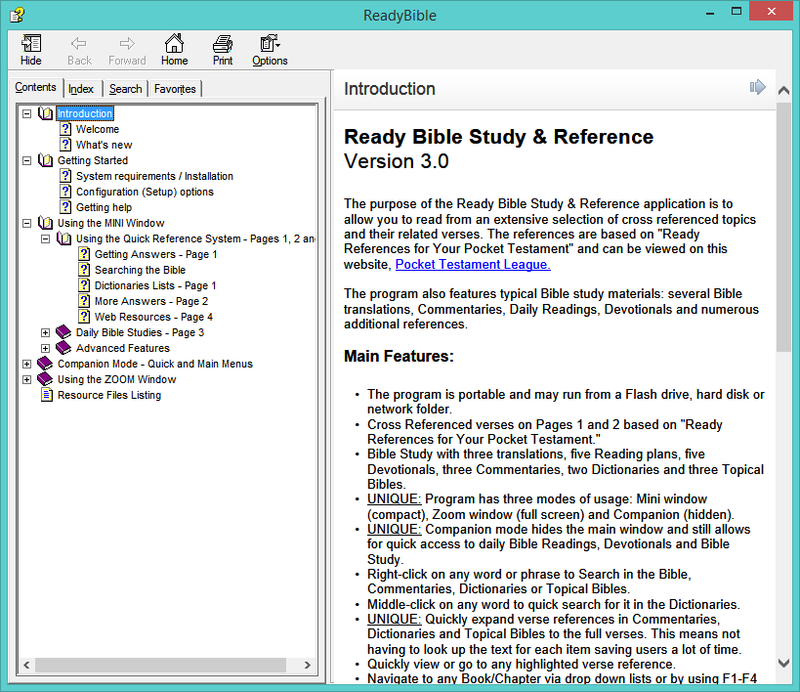 Version 3.14 of Ready Bible Study is now available! Scroll to the bottom to see information on recent changes. 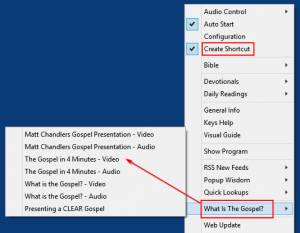 v3.13 – Added Jesus Speaks popup, updated Devotionals and Famous Quotes. v3.03 – Recompiled the program to avoid some antivirus messages. v3.02 – Mousing over program icon in the system tray now displays Left/Right click for options. Added Visual Help Guide to the left click menu. v3.01 – Created a new Help file, click Visual Guide or type a ? to display it. v3.00 – Added a left-click Menu to show daily progress, reorganized the right-click Menu, added visual indicators of which Readings have been done for today. v2.93 – Moved all add on files to Resources folder for a cleaner installation. 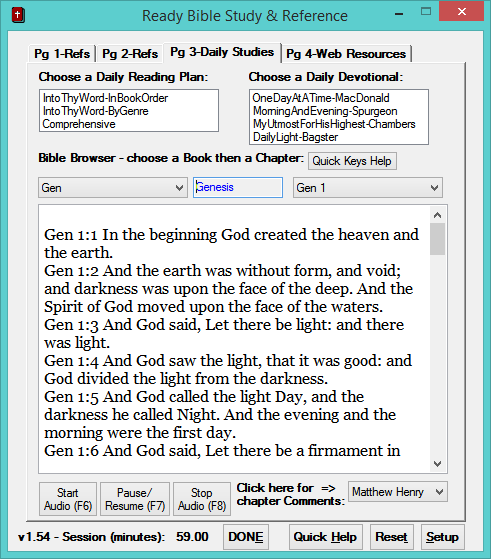 Since early 2016, my freeware Bible program, Ready Bible Study and Reference, has been available online. I was studying a very small Bible tract that had about 180 verses cross referenced in different groups. I wondered how hard it would be to translate it to a computer program. 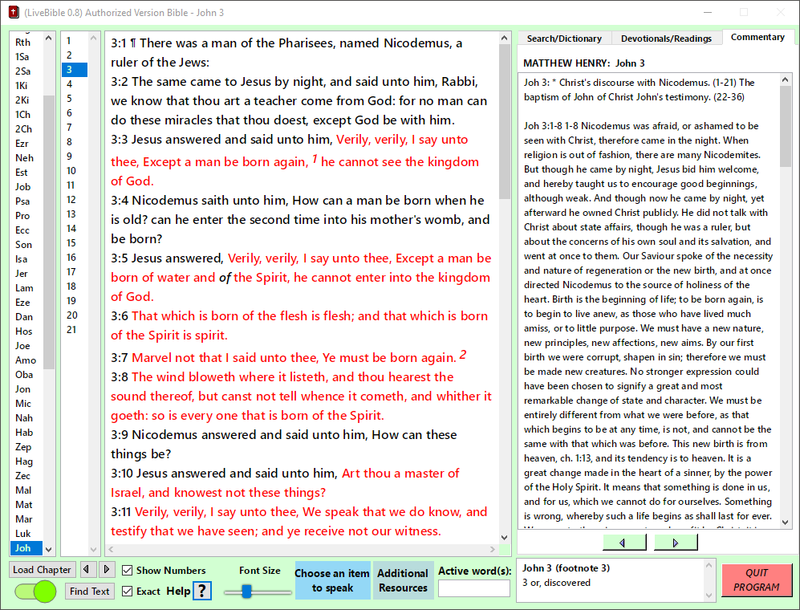 I had to write a lot of code and learn how to format Bible text but was able to do it fairly easily. Then I decided that it could track readers progress with visual clues and colors. Then I added a simple Find or search function to it and realized that computers are 1,000 times faster than when I first used one in 1982. That Z80 processor running the CP/M operating system ran at 4 megahertz. Well, today, everything runs at between 1 and 4 gigahertz, which is a simple factor of a thousand. But, computers today are also running dual core and quad core processors. So, they may easily be 10,000 times faster since 34 years ago. To make a long story short, I searched on the word God and in 2 seconds I had a window with over 4,000 Bible verses containing that word. The script read all 31,000 verses and pulled out the matching ones into a new window in that short time. Well, I was flabbergasted because I was using the AutoHotkey “scripting” language and thought it would be much slower than that. I now had the idea of building a general purpose Bible Study application. Over the next four months, I found and editing several Bible texts, commentaries, devotionals and reading plans. I figured out how to use the Windows INI file format for saving, searching and retrieving what was needed. And I had to research many articles in order to get the scripting language to do everything I wanted. 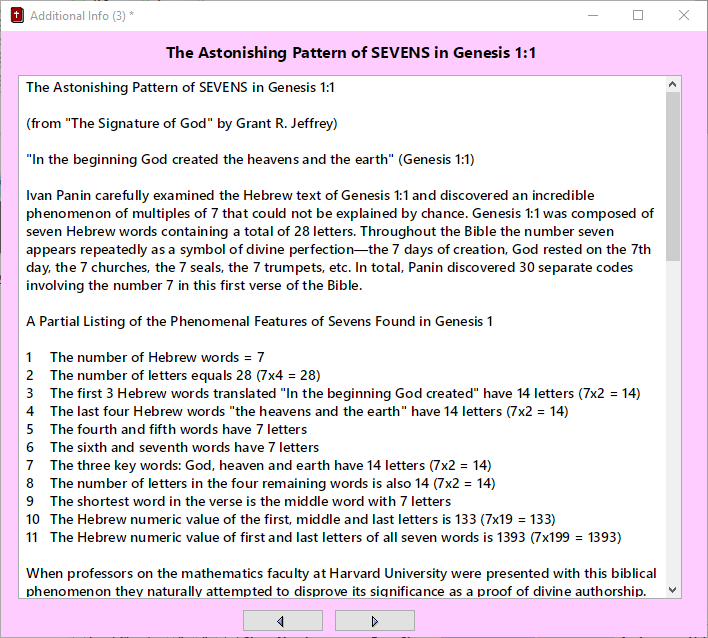 The software has an entry level Mini window with cross referenced questions and answers on the first two pages, a general Bible Study on page 3 and additional web links on page 4. 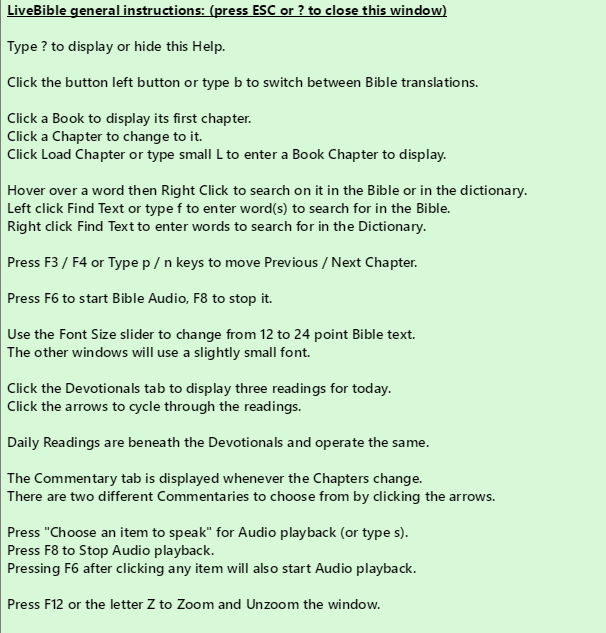 By pressing F10, users can switch to/from the Bible Zoom window which can use full screen. A picture of each window is below. 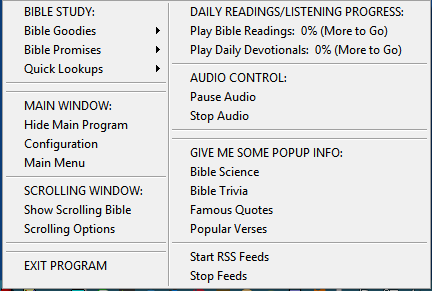 Searching on text, viewing Daily Readings and Devotionals and other items each have their own window. 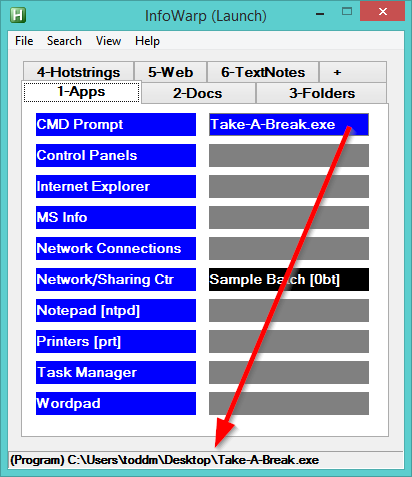 If you click the program icon in the task bar, the program will hide and run in Companion mode with various features accessible from the right-click menu. Just open the ZIP file and drag or copy the one file into a new folder and run it from there. 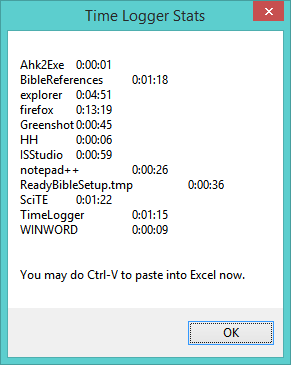 All of Bibles, Commentaries and other data files will extract from the main file when first run. BEGINNING USERS should just use the first two pages which provide answers to many of the questions they are probably asking. 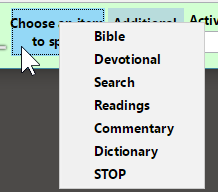 INTERMEDIATE USERS will probably want to concentrate on page 3 which contains Bible study tools. 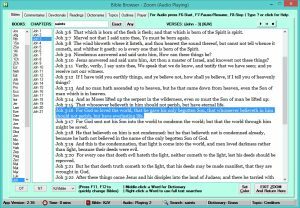 POWER USERS (those who have used other Bible software) will feel most comfortable with Bible Browser Zoom, just press F10 to go there. Please share this with anyone you know that needs a handy Bible reference and wants to learn more. ** IMPORTANT AUDIO NOTE ** When you click Start Audio from any window, it will change to Add Audio. Now, whenever you click Add Audio, that text will be added to the current Audio queue. In the bottom right corner of the Main Window it will display text like ‘Audio: Playing 3’ which means there are 3 items in the queue. Double-clicking on that part of the Main Window will display titles of the items in the queue. 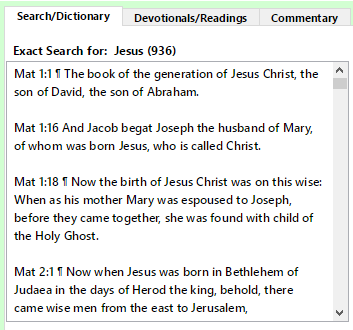 Click on any item in a drop-down list to view its related Bible verses. 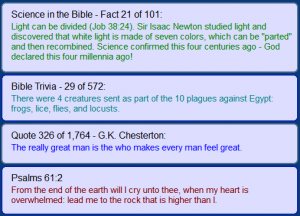 Many of the items are Page 1 are drop-down boxes listing various groupings of Bible verses. Simply click on the drop-down list then click on the Item you wish to read. 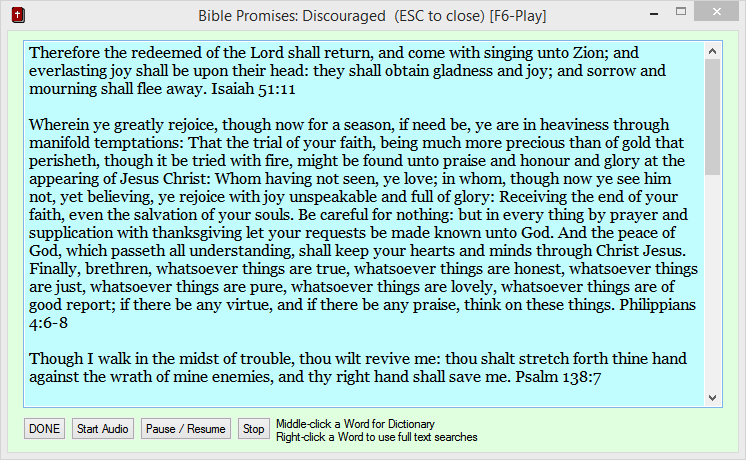 Whenever you read the verses associated with an Item, the Heading for that drop-down list will turn Red. This indicates you have started reading that section. If you read from top to bottom, selecting the last entry will turn the heading Green. This means you have read all of the section. If you wish to read in a different order, you may set the heading Green by holding down a Shift key then clicking on the heading. So you may read any group in any order. The program will mark headings in Red or Green automatically. It will also store which Item you last clicked on in each Group. You may also search anywhere in the Bible. Three translations are provided. 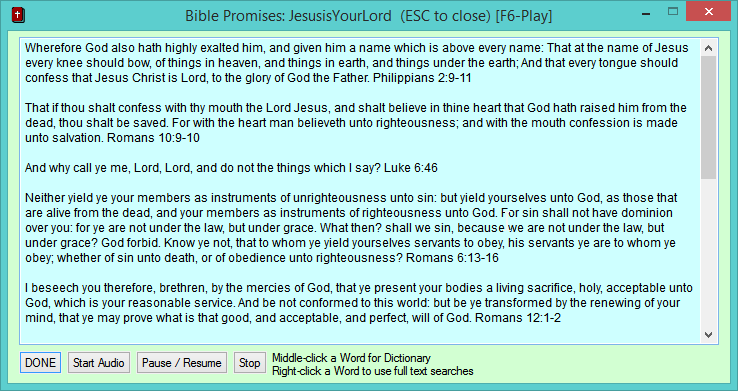 For more information on Bible searching click on the ? button. the Fausset Dictionary are located at the bottom right of Page 1. And using Alt-D presents both dictionary lists for you search on. 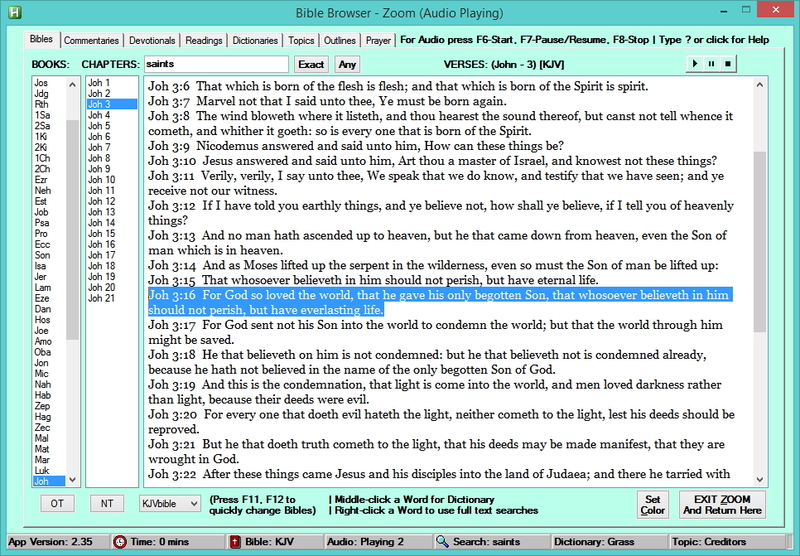 Chain Reference and Naves Topical Bible are located found in ZOOM mode. And using Alt-T presents the three Topical lists for you search on. which are displayed in a PDF viewer. Opens up a window from where Notes on any topic can be added and managed. sections of text you have queued up to play. You may exit while Audio is playing. You will be asked to save the Audio Queue for use next time you start the program. 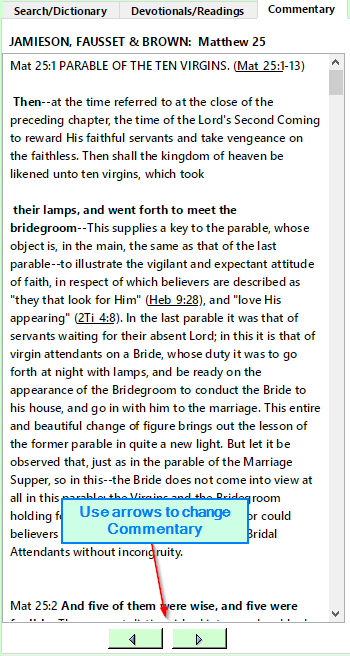 Click on any item view its related Bible verses. It will change color to Red indicating you have visited it. Hold down a Shift key and click on any item to mark it Green signifying that you have read of its contents. 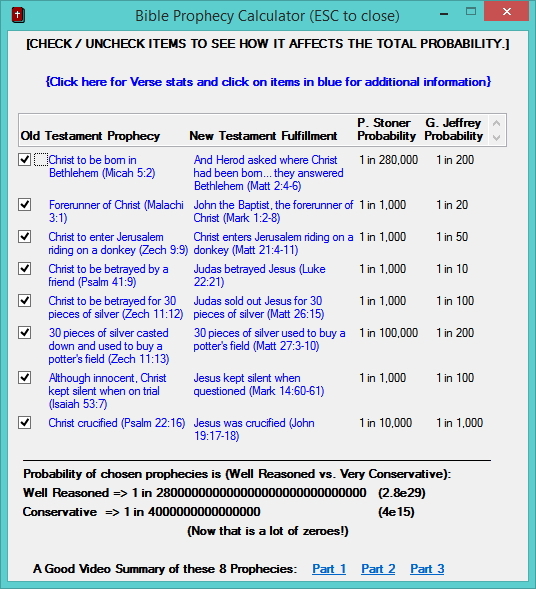 Clicking an item in the Prophecy list will display the Old Testament prophecy along with its New Testament fulfillment. The Prophecy heading will change to Red color. Once you read the last item in the list, that color will change to Green. 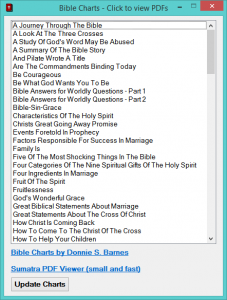 Five (5) daily Bible Reading Plans. Click on Advanced Features to display more details. 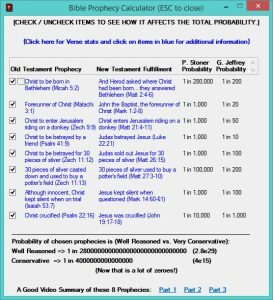 Click on the items in Extras to display some PDFs and Prophecy related information. Click on Add Notes for Notes manager. Click on PDF Charts for a list of one page informative charts. 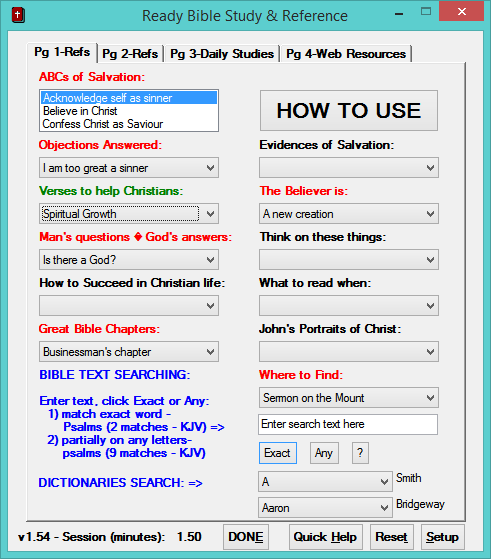 Links to various freeware Bible applications for both Windows PC and Mobile Devices are found on this page. Additional links to Bible Study resources are here also. 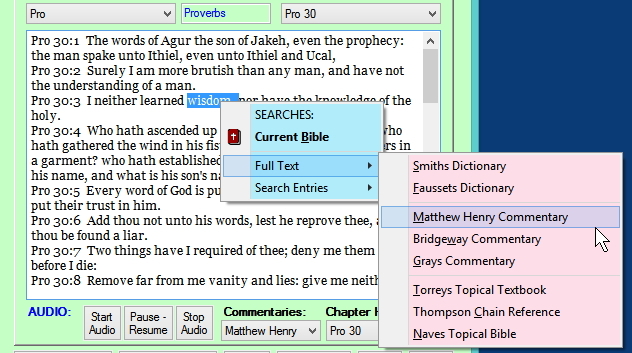 This window allows for easier reading of Bible text, Commentaries, Devotionals and Reading Plans. If you are primarily focused on reading the Word, this may be a better place to work from. 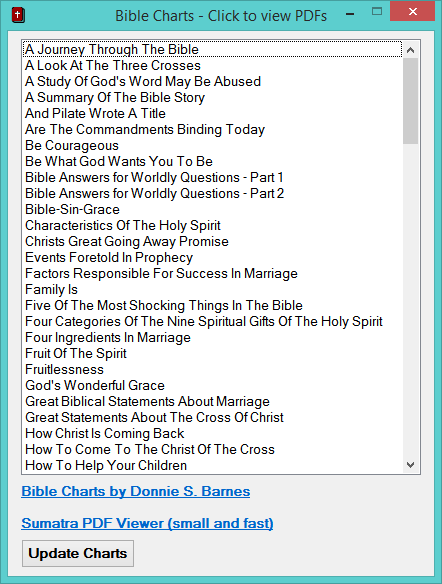 Every Bible resource from the Main Page 3 window are here, each in a separate window. 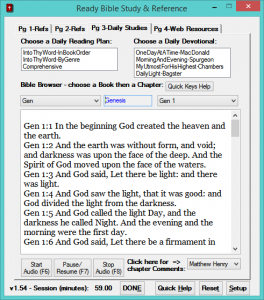 Pressing F11, F12 will switch between Bibles, Commentaries, Devotionals and Reading Plans. 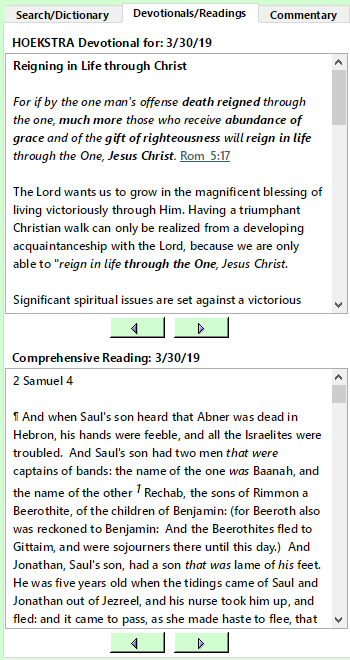 Relevant Commentary for the current Bible chapter is automatically shown as are today’s Devotionals and Readings. For Devotionals and Reading Plans you may click on <, T or > to display previous day, Today or next day readings. 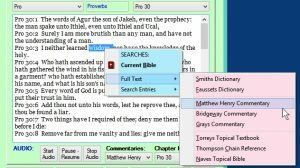 For those who believe the King James Bible to be harder to read, the Dictionaries window contains the King James Word List which is short definitions to words uncommon today. 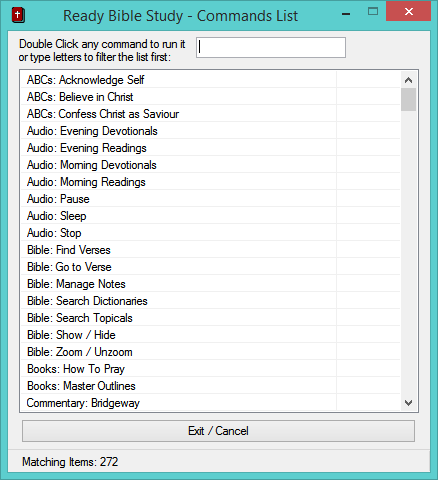 – Instead of just displaying all related verse numbers of a topic, this window retrieves all of the verse text for easy reading or audio playback. Press F10 to enter and leave the Zoom window. If you click Exit in Zoom mode, the program will return to it. 2) Enter a font size from 8 to 14 points. adjust the Voice speed with the Speech control panel. 6) Show Help Tool Tips – you may turn these off once you know your way around the program. 7) Session Time Limit in minutes – defaults to 20 minutes and reminds when 20 minutes are up. 8) Total Reading Time in minutes – this may be changed to any number or set to 0. The new left click menu – left clicking on the program’s tray icon will now display a more concise menu. 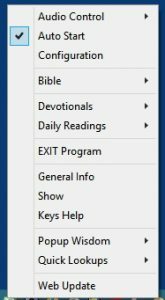 From this menu you can access key program features, display the Scrolling Bible, play daily Devotionals and Readings, display Pop up info and news feeds. Whenever you have started to listen or read to daily studies, the menu will turn blue. 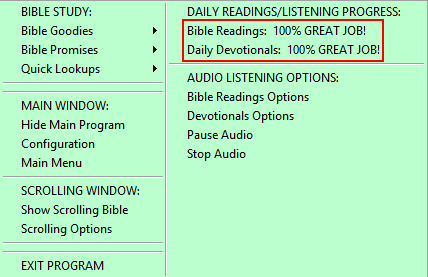 Click “Play Bible Readings or Play Daily Devotionals” to start your studies. Once the standard studies have been done for the day, the menu will turn green. The program now includes a comprehensive Help file. Click “Visual Guide” from page 1 or type a ? to display the new help. When you type ? you will get help based on which window or page you are viewing. This help was needed and overdue, but, felt like writing a book. I hope it helps users to use more capabilities of the program. 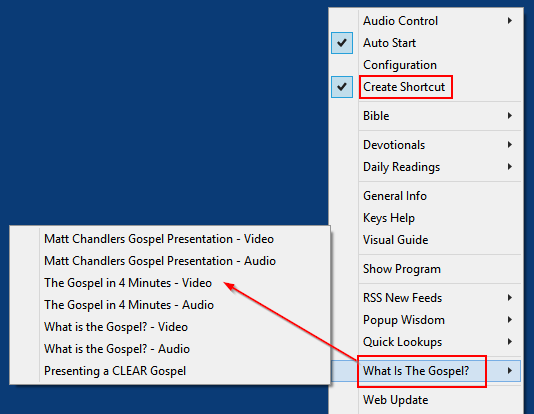 Clicking the program icon in the system tray gives options to show or hide the Bible program or the Scrolling window. Mousing over the scrolling window. Right-click the scrolling verse to see it’s chapter text. Optional settings for the scrolling window are here and are remembered. Bible Promises are accessed through the menu. Sample of one set of promises. 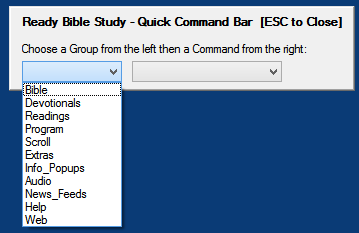 There are two additional keyboard commands that give users access to all of the options in Ready Bible study without using the program’s menus. Thus, these are primarily to be used when the program window is hidden. There is the Quick Command Bar and the Full Commands List. Holding down a Shift key then pressing the Backspace key will display the Quick Command Bar. This window contains the primary Bible commands. Simply press the First letter of any commmand on the left side to see a list of options for that command on the right side. Press the First letter of a right side command and it will execute. 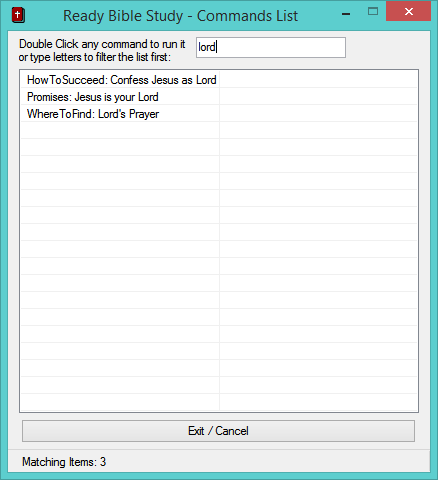 Holding down both Ctrl keys will display a window with all of Ready Bible commands. Typing in a word or two of interest will filter the list. Double-click any item to display it. This is another feature that allows control of the program, even when it is hidden. 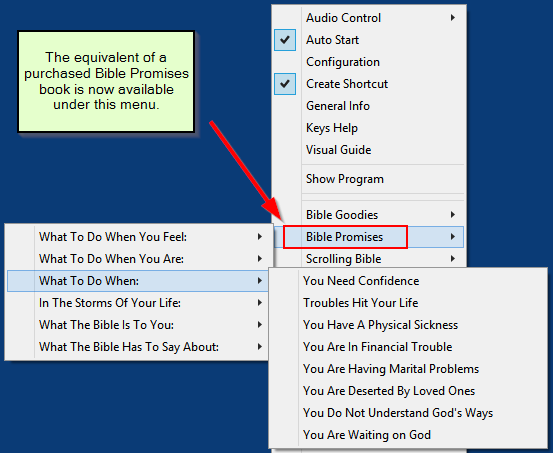 Double-click “Promises: Jesus is your Lord” Hopefully, this keyboard access to program features will make it easier for all to do basic Bible study. The newest version provides menu options for setting the location of notifications and lets users display 1 minute countdowns during Work intervals. The program also shaves 5 minutes from the work intervals so if users only take a 5 minute break they can keep on track with meetings or other scheduled events. After reading more articles about how people don’t take enough breaks from working at their Office or Home office computers, I decided to write a quickie application to remind them to get up and leave their computers every so often. As with any reminder program, users have to make up their mind to ‘obey’ the reminder notices. And that can be a difficult thing to do. The new program is called Take-A-Break. When it is first run, this information window will be displayed. 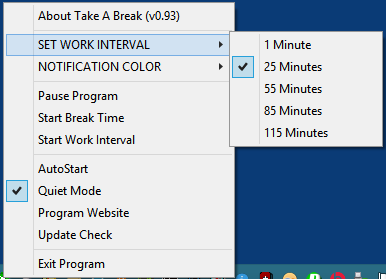 Take A Break defaults to 25 minute Work intervals and recommends 5 minute breaks until users select a different value. Users will see this notice at the start of each work interval. This notice will disappear in a few seconds. After 30 minutes, a Break timer window appears requesting users leave their computer for at least 5 minutes at a time. 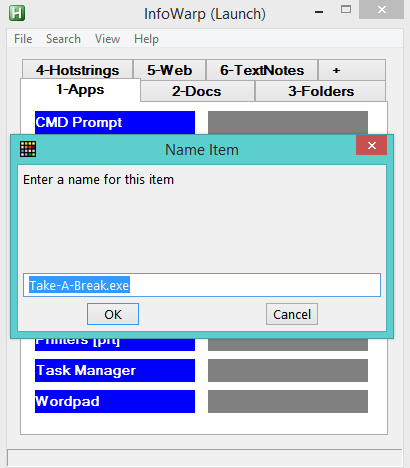 The Break timer window remains on screen to show how long a break users have taken. The window will not interfere with any typing in progress and can be moved to any position. When you are ready to go back to work, just click ‘Back to Work’ and the 30 minute timer will start over. 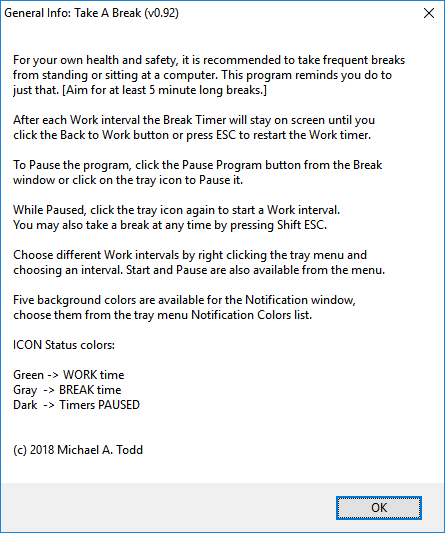 If you have a meeting or need to pause the program then click ‘Pause Program.’ The tray icon is Green for Work, Gray for Break time, and Dark blue for Paused program. 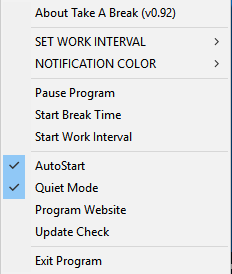 From this menu, you can also do Pause Program, Start a Break or Start a Work Interval. You may also choose AutoStart so that the program will run automatically the next time you sign onto your computer. The ‘About Take A Break’ will re-display the basic instructions. Left Clicking the program’s tray icon will either do Pause Program or Back to Work. From your keyboard, you may also press ESC to close the Break window and start Work. And you can press Shift-ESC at any time to go into a new Break. These two key settings will probably be user changeable in the near future. But, from experience so far they don’t appear to interfere with normal Windows applications. Users can now set the background color of the Notification messages via the menu. 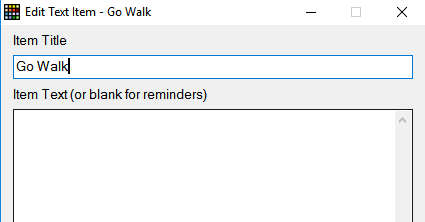 That’s all there is for this reminder program. I have tried to keep it very simple and effective. [* UPDATE 6/30/18 – Relevant Notes v1.15 download is here. 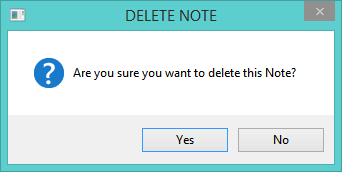 Relevant Notes] Just Exit Relevant Notes, open this Zip file and copy the executable to the same folder as earlier versions. You can also select Update Check and if a newer version is found, you can have the program open it for you. For network users, the newest release adds saving of settings, last color and font size into their PC’s Registry file. In this way, network users can change any of those settings independently of other network users. 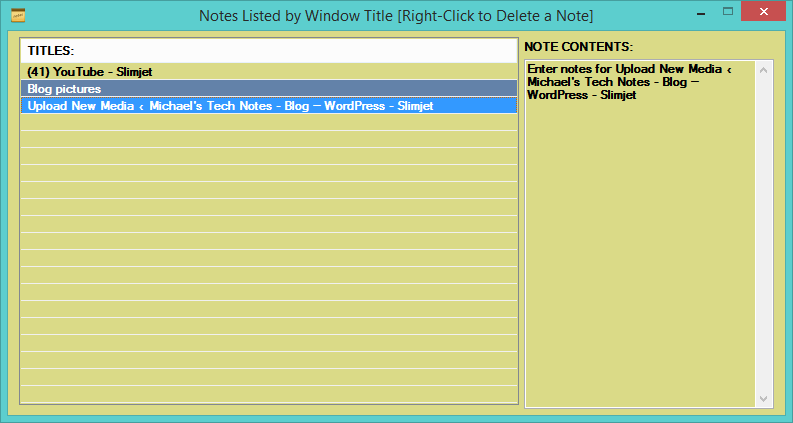 For all users, the Notes window now has a C button for settings Color/Font size for the current note. And those changes are made the default for the next created Note. The ? button was removed and that information is accessed from right-clicking the Relevant Notes icon on the task and choosing About. A short demo is below. 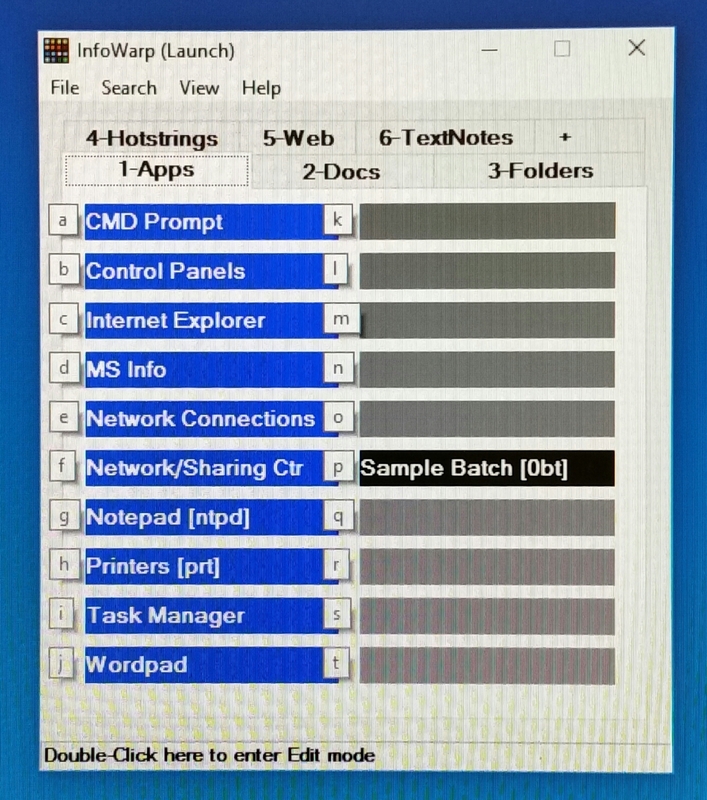 For the last couple of years I have looked at several programs which manage computerized versions of paper Sticky Notes. 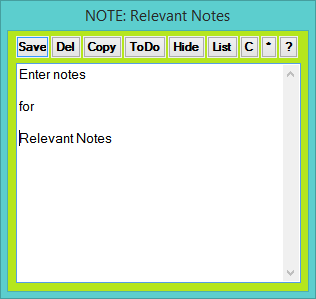 Programs like Stickies 9.0, PNotes, Stick-A-Note and others are well made and have lots of features. But, I decided I would write my own program at some point. About a week ago, I got started on the project and came up with what I call Relevant Notes. The program is very small and allows users to attach Notes to any window, webpage, document or folder. On startup, users will see the instructions below. Clicking on the Website will take users to this Blog page. 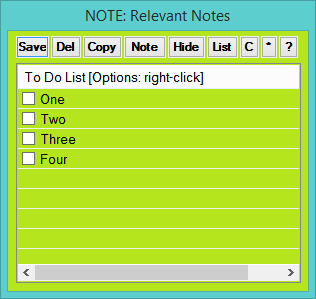 Notes can independently be resized and positioned, have their background color and font size set. When creating new notes, they will use the last settings a user selected. 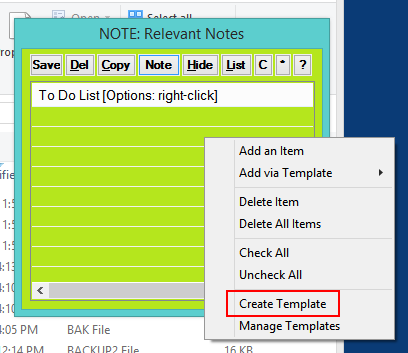 Below is an example folder with a new note created by pressing CTRL-ALT-N.
By design, the creation of a note does not move the cursor from whatever you are doing. To edit the note text, click the Edit button. Users can click Save or when the Note is closed, it will be saved automatically. You can also create and use a To Do list for every Note. You must first create one or more Templates. Right-click on the Tray menu or after clicking the ToDo button then right-click as below. Edit the Template Title and add your list like below. After you save the Template it will appear in the Add via Template submenu. You can also Add and Delete items one at a time. After selecting a Template, the list will appear with check boxes. Switching between a Note and its To Do list saves either. But, I like to click on Save anyways. Other options for notes include: Delete, Copy (clipboard) and Hide (temporarily). Users will be prompted for some of these. If you need to change the default Hotkey then go to Settings from the tray menu or click the asterisk (*). If you use files on flash drives you can check Ignore Drive Letters to not include it with the note title. This way the note will still appear when using the flash drive on different computers.You can also set the delay time or sensitivity which is how often the program checks for window changes from a quarter of a second to one second. The default is 250 milliseconds. If the program is run from a network folder then setting the Network Update Check may be important. Clicking on the question mark will re-display the Help information. As users click different windows, only one Note can appear, if the current window has one attached. This means that note is relevant to that window. All notes may be hidden by clicking on the Tray icon or right-clicking the icon and choosing Hide Notes. Once you are comfortable with the program, it can be set to Auto Start from the same menu. 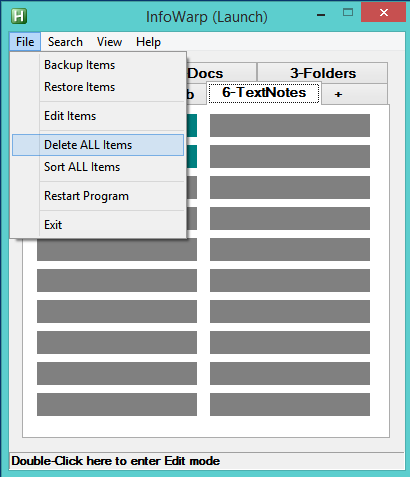 If notes become separated from their parent windows (document, folder, web page), users can delete them using the Manage Notes menu option or by clicking on List inside a Note window. 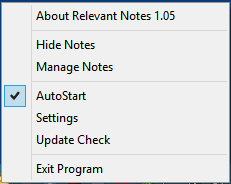 The Manage Notes window appears as below. Notes are sorted by their attached Window Titles with contents shown as they are clicked on. Right click any title and choose Delete to remove a note. There is also a Manage Templates window just like this one but filtering on Templates. 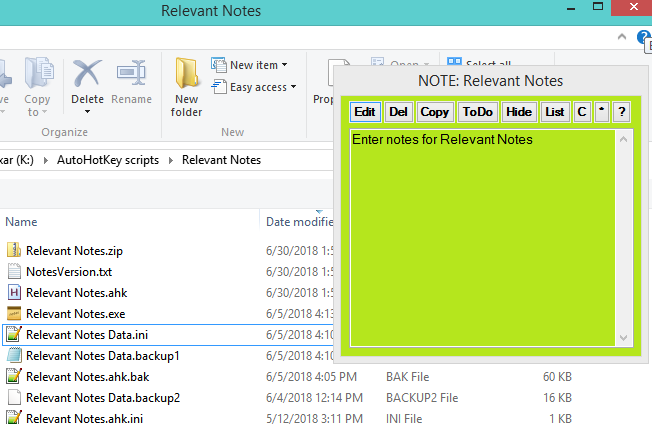 All notes are stored in the same folder as the program in a file called Relevant Notes Data.ini, so don’t delete that file! Starting with Version 1.06 there is basic support for sharing notes from a network location. A small work group can now create and share notes for networked files, folders and web sites. There will be a more noticeable delay when creating a note but other users will see them quickly. The program will check every 5 to 15 seconds for changes to the Notes database and update any onscreen Note if needed. Users may see a file is being edited message box but it should be rare. *THIS IS NOT INTENDED TO BE USED HEAVILY ON A NETWORK* but from my testing it should work adequately. In order to avoid saving lots of file changes, the size and position of notes is not saved. You may temporarily move/size notes but the next time a note is displayed, it will be in the upper right corner of its parent window. This is because some users have one monitor, some have multiple monitors. The program re-positions notes because of this so that for any parent window, its associated note will be visible. Some of this positioning is still being worked on. Starting with Version 1.062, if a different Hotkey for the network run program is chosen then users can run a local copy of the program as well. There could be two notes displayed for a file or folder, just keep that in mind. Network Note windows display •NOTE: instead of NOTE: to denote it is a network stored note. 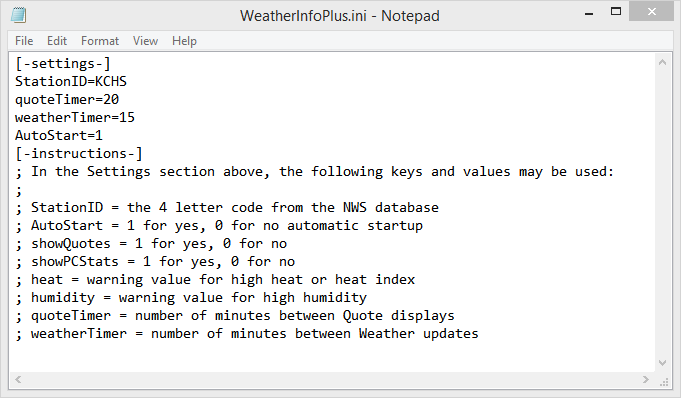 When displaying the List of Notes, the title will show whether they are Local or Network. Have fun trying out the new features!